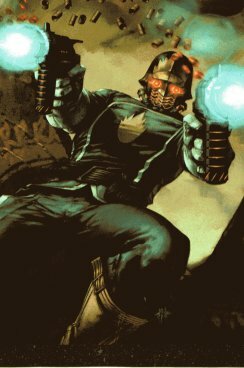 Powers/Abilities: Star-Lord wore a costume that enabled him to survive in space. It is possible that the costume has actually altered his physical structure, as he does not need to wear any helmet, or any form of life support to survive the nearly absolute zero, airless vacuum. He can fly through air or in space, presumably another attribute of his costume. He possesses enhanced healing and uses personal energy shields. In the event that he were injured beyond his own ability to recover, Ship could administer emergency medical or surgical care. He wielded the Element Gun, which can generate and manipulate the four ancient elements: earth, air, fire, and water. The Gun actually serves as a portal in space, drawing the above elements from the planet. While the supply of these is practically limitless, removal of excessive amounts of one form may up set the balance on that planet, with catastrophic consequences. The use of the Element Gun is limited only by Star-Lord's will, focus, and imagination. In addition, Star-Lord is highly athletic, a skilled marksman and swordsman, and proficient at hand-to-hand combat. After overcoming his lifetime of hatred, Star-Lord took a vow to never take another life unless absolutely necessary. His greatest asset is his partner and would-be lover, Ship. Star-Lord later received a number of cybernetic implants, including his left eye, which allows him to see all energy spectrums, as well as a memory chip in his brain, which gives 100% recall. History: (Inhumans IV#4 (flash-forward) - As Jason, the prince of Spartoi left the planet Kritnah (exiled from the Spartoi empire by his father), Delphos, a precognitive member of the Shiar Imperial Guard saw his potential future--his search to prove his innocence would bring him to Earth, where he would meet a woman and have a child, destined to be a Lord among the Stars. At the conclusion of the vision, Star-Lord is seen battling some alien creature. (Marvel Preview#11(fb)-BTS) - When war broke out between the Sparta empire and the Ariguans, Jason's father summoned him home. En route, his ship blew a converter and he crash-landed on Earth. This was observed by Meredith Quill, who found and recovered Jason, and nursed him back to health. Over the course of a year, Jason and Meredith fell in love, but when he had rebuilt his ship, he was forced to leave. Not wanting to risk her life at the hands of the Ariguans (and knowing that she carried his son, and he didn't want to hazard that life), he left Meredith behind. For her own safety and sanity, Jason placed a mindlock on her memories of their time together, so that she would only remember it as a dream. Within a month, Meredith married her high school sweetheart, Jake. (Marvel Preview#4) <February 4, 1962> - Meredith gave birth to her son, Peter Jason Quill. Jake recognized that the baby looked nothing like him and flew into a rage, assuming Meredith had been unfaithful to him. Jake took the baby outside to kill it with an axe, but instead had a heart attack and died. It was an hour before Meredith had the strength to crawl outside and recover her baby, during which time Peter stared at the starry sky. Meredith's sanity and health were strained by the series of events, and she withdrew from life, devoting all of her time to her son. (Marvel Preview#4 ) <1969> - Peter grew up a loner, not fitting in with the other kids, and not wanting to do so, either. He was fascinated by science fiction shows and the US moon landing. (Marvel Preview#4) <Spring, 1971> - Peter discovered the scorched Earth where his father had crash-landed, but his mother explained it away. It did, however, serve to feed his dream of space and aliens. (Marvel Preview#11(fb)-BTS) - After a few years, Jason felt it to be safe to bring Meredith and their son to Sparta. However, as Prince, he was too involved in the war and could not leave, so he requested aid from his uncle, Gareth. Seeking to potentially gain the throne himself one day, Gareth decided to eliminate anyone else who would stand in his way, and so he hired Kyras Shakati of Cinnibar to kill Meredith and Peter. (Marvel Preview#11 (fb) - BTS/Marvel Spotlight II#6) - Shakati sent Rruothk'ar, Sith-Lord of the Ariguan Confederacy, to do the deed. (Marvel Preview#4) <August 11, 1973> - Rruothk'ar and a band of Ariguans traveled to Earth. However, their understanding of their mission was incomplete. They killed Meredith, but left her son alive, kneeling by her corpse. No one believed his story, but they were unable to prove anything different. Peter was placed in the state orphanage, where he continued to set himself apart from the other kids. In addition, he now developed an inner hostility due to his experiences. (Marvel Preview#4) <February 4, 1975> - On his thirteenth birthday, Peter ran away from the orphanage. (Marvel Preview#4) <November 11, 1987> - Peter enjoyed his lifelong dream, training for NASA. Still he remained isolated from other trainees and everyone else. He saved a fellow trainee, Greg Harrelson, from a centrifuge accident, but rather than accept his thanks, Peter berated him for his stupidity and turned a potential friendship into a mutual hatred. (Marvel Preview#4) <June 7, 1989> - Peter proved to be one of the most proficient graduates in the aeronautics program, but his lack of people skills continued to plague him. He was passed over for inclusion in the Mars probe program because it was known that he could not work with the other astronauts. Quill flipped out, cursed out his superiors, and got hee-hee-hammered on Jim Beam. (Marvel Preview#4) <November 23, 1989> - Missing that position served as a wake-up call to Quill and he reapplied himself, eventually being placed aboard the Space Station Eve. Quill was ecstatic to finally make it into space. (Marvel Preview#4) <January 26, 1990> - The crew of the Eve were confronted by the image of Star-Lord, which described itself as a concept one of them would become, in 14 days. Quill proudly volunteered himself, but was turned down, in favor of someone with more space experience--Greg Harrelson. Quill went ballistic, screaming and smashing anything he could get his hands on. He was soon discharged from service and sent back to Earth. (Marvel Preview#4) <February 9, 1990> - Quill, determined not to miss this opportunity, broke into Cape Canaveral and stole a scoutship. He arrived back on Eve and fought his way into the chamber in which Harrelson was being prepared. Quill forcibly dislodged Harrelson from the oval chamber and was taken in his place. He was instantly transported into a city in space, where the Master of the Sun transformed him into Star-Lord. The Master of the Sun then sent him to gain his vengeance on the aliens who had killed his mother. He soon encountered an Ariguan ship and slew everyone aboard, after which he immediately returned to the Master of the Sun's realm. Quill was unsure whether he had actually ever left the realm, but the Master told him that he had experienced his vengeance and was now free of his past life--"free to form a new life...Then come, Star-Lord. Leave your madness behind and walk with me." (Marvel Preview#15 (fb)) - - The Master of the Sun introduced Starlord to a sentient energy being that had once been a star. The energy being reformed itself to become his ally, "Ship." (Marvel Preview#11) - Star-Lord rescued the prisoners of a group of Slavers, taking them to the planet Windhölme. He was then joined by Kip and Sandy, two recent slaves, who wished vengeance on those who had sent the Slavers. Their search brought them to the planet Cinnibar, and to the merchant Kyras Shakati. They were briefly ensorcelled by Shakati's Telempathic Crystal, but managed to break free. Shakati tried to offer hidden information to Star-Lord in exchange for his own life, but Sandy killed him before he could speak--she then revealed that Shakati had a finger-blaster trained on Star-Lord and would have killed him had she not stopped him. Star-Lord and his allies narrowly escaped as the palace exploded, as it was programmed to do upon Shakati's death. Star-Lord learned that the profits from the worlds stripped by the Slavers were being used to replace the Emperor with his uncle, Gareth. Star-Lord and his new allies traveled to Sparta, where Ship was shot down and they crashed on the planet. Kip and Sandy were captured, but Star-Lord made it to safety and then rescued them. Quill confronted Gareth and his associate Rruothk'ar, whom he recognized as the one who had slain his mother. Star-Lord fought and killed Rruothk'ar and then Gareth, as well. He then met the Emperor, who revealed himself to be his father, Jason, and revealed his origins. Jason offered Peter the role as heir to the throne of Sparta, but he declined, preferring the freedom of space. Instead, Quill recommended that Jason adopt Kip and take him as heir to the throne. (Starlord Special Edition#1: Epilogue (fb) - BTS) - Kip attempted to convince Peter to return, but he chose not to. (Starlord Special Edition#1: Epilogue) - After having sat through the reprint of Marvel Preview#11, Kip and Sandy's children nodded off. Jason announced that he would abdicate the throne. However, later Starlord returned to see Jason, with Ship present, too. Sandy and Kip came to Jason's bed and found the imperial signet ring and Starlord's helmet, as Jason and Starlord, with Ship, too to the stars. (Marvel Preview#14) - A squadron of Lorq starfighters blasted Ship out of the sky over the planet Ferrol and she crash-landed on the surface. Star-Lord was gravely injured, and Ship created a human form to operate and save his life. When he revived, she pretended to be a woman who had found him, and named herself Caryth Halyan. Star-Lord and Caryth explored the planet, searching for what the Lorq had been after. She attempted to seduce him, but found the feelings this generated to intense for her, and so she broke it off. They encountered and saved the life of the Trinity-That-Is-One and its insectoid symbionts, and Star-Lord provided a water source to keep them alive. Then the Lorq attacked anew, slaying Caryth and destroying Ship before he could fight them off. Ship, however, as a being of primal energy, was able to reform. Star-Lord guessed that she had been Caryth. (Marvel Preview#15) - Star-Lord accompanied Ship on a mission to defeat the Haalmhad homeship, saving the planet Cymoril, although they were too late to save the planet Carillon. (Marvel Preview#18) - Star-Lord traveled to the planet Redstone, where he and Ship encountered Sylvana, Quan-Zarr, and the Beastmen. Quill stood back as the last of the Beastmen slew Quan-Zarr to retake the Power Rod, but then was forced to kill the Beastman to stop him from using the Rod to destroy Redstone. (Marvel Spotlight II#6) - Star-Lord sensed an attack on the Master of the Sun and rescued him. However, the Master instructed them to return him so he could accept his fate. (Marvel Spotlight II#7) - Star-Lord and Ship traveled to the planet Heaven, where they tried to save Thorn from Shreen and allow Thorn to regain his wings and return to the cloud world. Ultimately both Shreen and Thorn died, a result of their debts of honor. (Marvel Premiere#61) - Star-Lord investigated the planet "Symbion" (see comments). The planet, a sentient being, tried to form a temporary symbiosis with him, but he mistook it to be a parasitic creature. He broke free of its clutches and planned to destroy the planet to prevent it from taking other victims. Ship talked him out of it, and he left the planet behind. (Marvel Super Special#10) - Ship and Star-Lord were pulled through a warp associated with a black hole and were separated. There Star-Lord met an alien race living on a massive, planet-sized ark. Their leader, Noah, initially claimed that they were the last remnants of the human race, having come from 3 million years in the future. However, another member of the race, Aletha, revealed that they were aliens, using illusions (which they called "smoke") to appear to be human. Aletha revealed that "Noah" and his allies had actually sought to use Star-Lord's knowledge to conquer Earth and take it for their new home. With Star-Lord's aid, Aletha and the rest of the people of the ark overthrew Noah and his warlords, so that they would then live on the ark for the rest of their lives. After a brief affair with Aletha, Star-Lord was then reunited with Ship. As they left the ark, Ship revealed that she had been linked with Aletha for the course of their adventures. (Star-Lord#2(fb)-BTS) - Ship, and presumably Star-Lord, were caught in the pull of a black hole. Ship narrowly escaped destruction by "slingshotting" around the gravity well, but she crashed on the planet Bovric. Twelve years later, Star-Lord was still missing, and Ship had no memory of what had happened to him. Ship encountered and trained Sinjin Quarrell to be the new Starlord until they could find the original. (Thanos#8 (fb) - BTS / 12 (fb) - BTS) - Star-Lord received several cybernetic implants, including a left eye and a memory chip. (Thanos#12 (fb) - BTS/Annihilation: Conquest - Starlord#1 (fb) ) - Star-Lord subdued the Fallen One, former herald of Galactus. However, the energies required to do so caused massive collateral damage, leaving 350, 000 dead. Star-Lord was sent to the Kyln interstellar prison for these deaths, where he relinquished his title, going only by the name Peter Quill, and claiming to have killed the Star-Lord. (Thanos#8) - Within the Kyln, Quill discussed how to deal with the Maker (Beyonder/Kosmos) sharing a debate with fellow inmates Ch'ak, an unnamed Badoon, and the Imperial Guard's Gladiator. Their meeting was interrupted by Thanos, who identified him as Star-Lord, but Quill told him Star-Lord was dead, by his hand. The group shared the threat of the Maker with Thanos. (Thanos#9) - Quill, Gladiator, Ch'ak, and the badoon observed as the Maker lashed out at Thanos, wondering whether he was still alive. (Thanos#10) - Gladiator told Quill the details of the Maker's capture, and they both continued to wonder if Thanos had survived. Thanos subdued the Maker and received Gladiator's gratitude. (Thanos#11) - Quill led Thanos into the Kyln Creche to reveal that during the Maker's assaults, the Fallen One had escaped from its containment. Quill then realized that Thanos' companion, Skreet, was holding another Kyln convict, Mynx, prisoner. Quill (revealing himself to be familiar with the interstellar Lunatik) convinced Skreet to release Mynx, and Mynx told Quill that she always paid her debts. Quill told her he was counting on that. 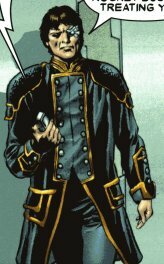 Gladiator met with Quill, telling him that Quill had been remanded to his custody and drafted into the Shi'ar Imperial Guard. (Thanos#12) - On a Shi'ar Imperial Cruiser in orbit of the planet Eden, Quill met with Astra, Earthquake, and Gladiator, discussing plans to deal with Thanos. (Annihilation#1) <Annihilation Day plus 204-206> - Quill served as advisor to Nova, commander of the United Front. On Daedalus 5, a world on the periphery of the Kree Empire, Quill advised a strategic retreat as Annihilation Wave forces threatened to overwhelm the United Front. When Firelord incapacitated Extirpia, the Annihilation Wave hive she controlled fell into disarray, and the UF forces drove them off. From the captured Extirpia, Quill and Nova learned that Annihilus' forces had defeated Galactus. (Annihilation#2) <Annihilation Day plus 212> - Quill and Nova joined Ronan in a meeting with Kree agents representing the ruling House of Fiyero, watching with amusements as the Fiyero representatives tried to slay Ronan, who slew them instead. When they subsequently met with Praxagora, bearing the seeming corpse of the Super-Skrull, Quill and Gamora were suspicious, as she was a resident of the Negative Zone. The confrontation was interrupted by the sudden arrival -- via Thanos' teleportation equipment (as Quill swiftly determined) -- of Ravenous, his Currs, the Mad-Thinker's "Most Dangerous" android, and the parasite-controlled Delinquent, Paibok, and Terrax. Quill summoned Stardust and Red Shift from space to oppose Ravenous, though he was mildly annoyed to learn that Ravenous didn't consider him a valid threat; he was even less pleased upon the arrival of Annihilus' Centurions. (Annihilation#3) <Annihilation Day plus 212> - Quill determined that the Annihilation Wave forces would overwhelm them and recommended full retreat, and Phyla-Vell protected him from the Centurions and then flew him to an escape ship. Quill and others escaped, with Drax holding off the Wave from their ship, after which Thanos' technology used Galactus to consume Daedalus 5. Soon thereafter, Quill informed Nova of the United Front's dissolution and their plans, but was surprised when Nova announced his intention to take out Annihilus. (Annihilation#4) <Annihilation Day plus 220> - Though warning Nova that he would die trying to take out Annihilus, Quill joined him in his quest, alongside Phyla and Cammi. Nova begin phase-transporting them, a procedure with a 40% chance of fatal error. (Annihilation#5) - On Canticus Prime, Nova, Quill, and others accepted information from Blastaar to get them within striking distance of Annihilus' flagship. <Annihilation Day plus 268/Armistance Day> - As Nova still recovered, Quill told him that there were factions who wanted Nova to stay on to help the new order. (Annihilation: Conquest - Prologue) - Quill flirted with Blue Kree military agent Ten-Cor. Directing operations on Hala while Ronan was off planet, Quill arranged for the Spaceknights to upload their A-Ware to upgrade the Kree Empire's communication and weapons systems. However, the Spaceknights had fallen under the control of the Phalanx, and the A-Ware put the entire Kree Empire's military operations under the Phalanx's control as well. Quill tried to get Ronan to shut down the system, but the Spaceknight Daystar crushed his communicator (and his right hand). Quill pulled his blaster, shot Daystar in the face, ordered the Kree to attack the Phalanx (to little avail) and fled into a building. He ran into Ten-Cor and other Kree, but as he tried to prepare resistance to the Spaceknights, he found that Ten-Cor and the others were already under Spaceknight control. They blasted him repeatedly and he fell out of the window of a tall building. (Annihilation: Conquest - Starlord#1) - On Aladon Prime Peter was healed and his cybernetic implants were removed. A few hours later he was brought to Kree Intelligence First-Tier Admiral Galen Kor. He received a universal translator and was made the leader of a team of criminals (Bug, Deathcry, Mantis, Rocket Raccoon, Captain Universe and Groot) to find and destroy a Phalanx system capable of infecting whole worlds. Armed and outfitted in a new heat-dampening suit he, along with the rest of his team was brought to a Kree outpost and then liquid-fuel-projectile-instered to Hala. (Annihilation: Conquest - Starlord#2) - On Hala the team was attacked by Phalanx sentries. They fought more of them in the lower levels of the Replication Plant along with Annihilation Wave insects. Star-Lord lost Deathcry and Groot during the latter encounter, but the rest of his team escaped through a pipe. (Annihilation: Conquest - Starlord#3) - Peter removed his uniform and was found by a Kree. He was brought to a Phalanx sentry and received Kree clothes to hide in plain sight and continue his search for the replication laboratory. When he found out that the Phalanx used an airborne techno-virus, he returned with the info to his team. Back in uniform his team had to flee from vermin-eating Phalanx drones. Except for Captain Universe, who fought the drones, and Mantis, who just got away using her powers, they all escaped the drones and ran right into the tentacles of Phalanx sentries. (Annihilation: Conquest - Starlord#4) - Peter, Bug, Groot and Raccoon were broken out of prison by Mantis. Their escape was thwarted by Kree, but Peter eventually realized that they didn't even try to kill them. When the Phalanx realized the treachery they deactivated the Krees' weapons. Star-Lord and his team were free to go and after fighting a few more Phalanx and their sentries, they escaped in a spaceship and flew to Alon-Gim to report what they found out about Phalanx contagion countermeasures through the Uni-Force. Peter's team was then sent back in to fight the Phalanx. (Annihilation: Conquest#1 - BTS) - Blastaar was caught by the Phalanx as part of a scheme to get Mantis' spores into the Phalanx Babel Spire. (Annihilation: Conquest#2) - Blastaar released the spores and Star-Lord and his team were ready to attack with a plan of the spire in front of them. (Annihilation: Conquest#3) - Star-Lord's team planted explosive loads inside the spire. Star-Lord was with Gabriel Vargas (the former Captain Universe) when they were suddenly attacked by Phalanx soldiers and Blastaar, who had been turned into a Phalanx Select. Vargas was killed by Blastaar and Star-Lord got caught and finally learned that Ultron was behind the Phalanx attack. (Annihilation: Conquest#4) - Quill was tortured by the Phalanx to reveal his plans. Ultron used his powers to read Quill's mind, but Mantis shielded his mind and read Ultron's mind instead until Ultron realized what was happening and stopped it. (Annihilation: Conquest#5) - Bug, Mantis and Rocket Raccoon freed Quill and escaped the spire, which was put on fire by Groot, who filled a tenth of the spire's superstructure and had been made ultra-flammable by Mantis. (Annihilation: Conquest#6) - The teams' fall from the spire was stopped by Groot. Back on the ground Ultron in Adam Warlock's body teleported in and attacked Quill's team. Quill was saved by Nova (Rider), while Mantis was heavily injured. Quill watched in shock as thousands of Kree Sentries became one giant Ultron, but the being was destroyed and all Phalanx soldiers were deactivated. (Guardians of the Galaxy II#1 (fb) ) - One day after the end of the Phalanx conquest Quill talked with Nova and Phyla about creating a proactive team to prevent future attacks on the galaxy. (Annihilation: Conquest#6) - Quill continued to blame himself for the whole disaster, but was inspired to do something in the future. (Guardians of the Galaxy II#1 (fb) ) - Two days after the end of the Phalanx conquest Quill had a few drinks with Rocket Raccoon. Quill still felt guilty about letting the Phalanx in and asked Raccoon to join his team because they needed his tactical skills. (Guardians of the Galaxy II#1) - Star-Lord led the Guardians Galaxy in an attack on the Universal Church of Truth's templeship Tancred to stop them from entering a fissure. The Guardians were shocked when the Church's higher-ups teleported to safety, leaving their followers behind to die. After entering the fissure the Guardians were attacked by an extradimensional monster, but they were able to hold it back until Rocket Raccoon blew up the ship's font. The team then teleported back to their base on Knowhere. Adam Warlock found another fissure. (Guardians of the Galaxy II#2) - The Guardians teleported onto an icy landmass that came through a disturbance near the star SG Hydronis. They encountered monstrous beings and Major Victory from the future. He joined them in fighting the monsters. They took Major Victory with them to Knowhere after blowing up the monsters and the icy landmass from the future. After the mission Quill told the others that Major Victory could be a sign like when the Avengers found Captain America. Along with Adam Warlock he watched Mantis talk to Major Victory. The Guardians later teleported to another fissure at Binary Stasis Twelve Dyson Sphere where Cardinals of the Universal Church of Truth attacked them. (Guardians of the Galaxy II#3) - The Guardians fought the Cardinals until they were overrolled by a biomass consisting of the former residents of the Dyson Sphere. They had been fused into this being after their experiments had opened a fissure in their DNA. Phyla protected the team after Star-Lord had opened the habitable zone's sun-shield to let the sun burn the biomass. Afterwards the team returned to Knowhere. (Guardians of the Galaxy II#4) - Quill, Mantis and Major Victory watched the video of Starhawk's attack on Major Victory on Knowhere. While walking with Cosmo through Knowhere, suddenly stopped them a second before an explosion went off and killed several people including some Skrulls. Before they could begin their search for more Skrull infiltrators, the Guardians were confronted by Gorani and Cynosure, who weren't happy about the Guardians of the Galaxy making Knowhere their base of operations or that they acted like they ran Knowhere. Cosmo told Quill and his team to stay in their quarters after a fight between Major Victory and a few aliens. The house arrest angered Adam Warlock, who blamed Quill for it. Mantis then informed Quill that Knowhere's continuum cortex chamber leaked radiation. Mantis was also afraid that the others would learn that Quill made her manipulate the others telepathically to join the Guardians of the Galaxy. Star-Lord and Phyla were interrogated by Knowhere's council about their teammates and they had to defend Drax. (Guardians of the Galaxy II#5) - Star-Lord assured Gorani and Cynosure that it was a bad idea to send the Luminals after Drax. After he had returned to his quarters he asked Mantis to locate Adam Warlock. Quill continued to get into fights with his teammates until suddenly Mantis collapsed while telling them that something terrible was going to happen. Starhawk appeared out of nowhere and attacked the Quill and the other present Guardians. (Guardians of the Galaxy II#6) - Star-Lord was temporarily killed by Drax's synaptic disruptor charges. He was alive again after Drax had deactivated the charges. Quill, Rocket Raccoon, Major Victory, Mantis and Gamora then overpowered Starhawk. Star-Lord and the other Guardians joined Drax, Adam, Quasar and Cosmo to protect the peaceful Skrulls from the Luminals. Star-Lord learned that Earth was invaded by Skrulls and the Guardians of the Galaxy couldn't help because Knowhere's continuum vortex was still undergoing reparis. Cynosure and Gorani confronted Star-Lord about protecting the Skrulls and Drax's attack on Knowhere and then returned to his quarters with Cosmo. There he was welcomed by angry faces because Drax, who had heard Star-Lord's and Mantis' conversation about the manipulation, had told the other Guardians about it. The team broke apart. (Guardians of the Galaxy II#8 (fb) - BTS) - Star-Lord tried to warn the Kree about the Skrulls through their Warnet, but he didn't get any answer and decided to go to Hala. (Guardians of the Galaxy II#8 (fb) ) - Hunted by Ronan's soldiers Star-Lord learned that the Kree had rebuilt the Babelspire with Skrull corpses. Ronan knocked out Star-Lord and had him thrown into the Negative Zone. (Guardians of the Galaxy II#7) - Star-Lord was tossed into the Negative Zone where he was welcomed by King Blastaar. (Guardians of the Galaxy II#8) - Star-Lord watched Blastaar kill Prince Gronch in a fight to defend his position as king of the Negative Zone. He was surprised to learn that Ronan made Blastaar the king. Blastaar then led Star-Lord to the Earth-built Negative Zone Prison 42. Blastaar wanted Star-Lord to get him inside the prison and to the portal that led to Earth because he planned to invade Earth. (Guardians of the Galaxy II#9) - Blastaar sent Peter Quill without armor to the prison. Jack Flag let him come inside. Jack took Quill to Gorilla-Man, Bison, Condor and Skeleton Ki, the other top dogs in 42. Quill and Jack stopped Bison, Gorilla-Man and Condor from opening the gates for Blastaar's army. Quill and Jack then went to Carrion to send a telepathic message through him to Mantis. She received the message and Cosmo teleported the Guardians of the Galaxy (Bug, Groot, Major Victory, Mantis, Rocket Raccoon) to the Negative Zone to help Quill. Comments: Created by Steve Englehart and Steve Gan. Officially connected to the Marvel Universe by Carlos Pacheco and Ladronn. Further cemented by Keith Giffen and Ron Lim. How does Star-Lord fit into the Marvel Universe? In Inhumans IV#4, in the modern era, as Jason left the planet Kritnah, Delphos (a precognitive) saw a potential future of Jason going to Earth and fathering the child who would become Star-Lord, consistent with his origins. The original Star-Lord series tied him firmly to having his origins prior to the modern era (it WAS the modern era then, but that's Marvel's sliding timescale for you). In that story, Peter Quill was born in 1962, his mother was killed in 1973, began training with NASA in 1987, and he became Star-Lord in 1990. Quill/Star-Lord appeared in Thanos#7-12, during which time his past adventures in Earth-616 were referenced. There pretty much has to be time travel involved somewhere. Another easy explanation would be to just make his adventures occur on an alternate Earth. That's fine, but doesn't explain what will happen to Jason of Spartoi in the Earth-616 reality. Star-Lord would still have had to travel to Earth-616 at some point. My preference: Jason arrives on Earth-616, @ 1961-1962, via intentional or unplanned time travel. There's no reason he and Ship couldn't have hit a time warp somewhere along the line. So, Jason travels back in time however many years it takes for him to get from the more recent end of the modern era to 1962 (perhaps overshooting his intended year) . I'm not quite sure how we have the adult Jason interacting with the younger Peter and the adult Star-Lord, but that's the only problem with this theory. 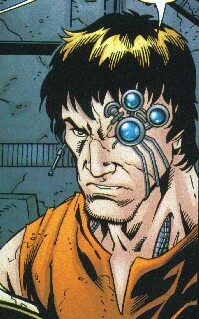 Perhaps Jason was actually time-traveling during the Inhumans series? The space station in 1990 parallels the real world timeline, with Mir getting its start @ 1986. Since his origins, Star-Lord may have been around for anywhere from 5-50 years or more. Jason could have returned to his own time (modern era), but then Star-Lord would have had to have time traveled again to get back to the modern era. Any of the above explanations take a little bit of retcon/re-structuring, so take your pick. I personally like to place events in the pre-Modern era whenever possible to fill the continually growing period between the documented adventures from the 1950s and Fantastic Four I#1, the start of the modern era (@ 12 years prior to the current year). Marvel Super-Special#10 was published in Winter of 1979, which would place it between Marvel Preview#18 and Marvel Spotlight II#6. However, the trip through the black hole seems to connect it to the disappearance of Star-Lord discussed in the 1996 Starlord series. I see two possibilities. Marvel Super-Special#10 took place in the order that it was published, Star-Lord and Ship returned to their original location, and there was a completely separate black hole adventure that led to Star-Lord's disappearance. Marvel Super-Special#10 took place after Marvel Premiere#61, making it the last known Star-Lord adventure. A portion of Ship's mind (and possibly her form as well) was pulled into the Black Hole with Star-Lord, and she eventually recovered her mind by linking with Aletha and by rebuilding herself from the ark. A separate portion of Ship escaped the Black Hole, crashing on the planet Bovric, where she was found by Sinjin Quarrel, with her memories damaged. Either way, there are still Star-Lord stories to be told. Doug Moench, where are you? And, of course, since in most cases in the MU, a child can be born from any single case of "relations," Aletha should have given birth to the child of Star-Lord. Happily, Keith Giffen has elected to use him in the Thanos series, confirming him and his stories as in-continuity. However, that series got cancelled--Crime against humanity!!!!! Still, maybe he'll show up in the Imperial Guard somewhere? When first written by Englehart, Star-Lord was a heavy mix of Astrology and Sci-Fi. Given that it was the seventies, I guess it could have been worse--he could have replaced Astrology with Satanism, or perhaps even Kung Fu. Englehart's Star-Lord was also something of a mad dog, with a lot of hatred inside of him. We'll never know where Englehart was going with this saga. There were about 18 months between the first and second Star-Lord sagas. John Warner, editor of Marvel Preview, maintained an interest in the character and decided to bring him back, but by this time, Englehart was involved with other commitments. The next batch of stories, written by Claremont, dropped the Astrology, as well as Peter's inner rage and hatred. There was a period of years, at least, in Star-Lord's time between Marvel Preview#4 and 11, so it is ASSumed that he came to terms with himself and mellowed with age. Why did his hair turned from brown to blond (in Marvel Preview#18 (the cover anyway), Marvel Spotlight II#6+7, and Marvel Premiere#61)? In Marvel Super Special, it was also blond on the cover, and brown in the story. Maybe all the exposure to sun/star light bleached it! Characters from the Starlord sagas, including Kyras Shakati and the Slavers from Marvel Preview#11 are seen at a party at Imperial Center, hosted by Lilandra Neramini, in Uncanny X-Men#125, also by Claremont and Byrne. Also present: Popeye! Changing Writer's Syndrome is usually a bad thing. However, while Star-Lord never made it into the big time (A Star-Lord series was in the works back in the 1970s, as discussed in the pages of Marvel Preview), I enjoyed all of the different takes. Englehart had the original dream, given form by Steve Gan. Claremont wrote Marvel Preview#11, 14, and 15, all full magazine length sagas, that fleshed out and re-defined Star-Lord. His first story was penciled by John Byrne, and the latter two by Carmine Infantino (Jim Starlin did the cover for #14--I had such hopes...). Doug Moench wrote Marvel Preview#18, Marvel Super-Special#10, Marvel Spotlight II#6 and 7, and Marvel Premiere#61, with Bill Sienkiewicz and then Tom Sutton. The only thing I DIDN"T like was Moench's retconning the Master of the Sun into being some alien renegade scientist. Boooo!!!! I liked to think of him as the Grand Nebular. Maybe it was all a plot of the Master of the Sun to confuse Star-Lord for some reason. Timothy Zahn and Dan Lawlis did the saga of Starlord's successor, in 1996, 15 years after his last appearance. And, of course, Pacheco and Ladronn brought him into continuity in the Inhumans IV limited series. Bravo to Pacheco for bringing a fringe character into the mainstream MU. I love this stuff. Maybe we could get Peter David or Jim Starlin to bring in Dreadstar? ...Well, there is Quarry, who is Izak....). Actually, it's probably best kept unrelated, but I wish we could have some more stories, anyway. I'm sure no one knows what I'm talking about, so I'll stop. Giffen cemented his existence in Earth-616 in the Thanos series. Bitter and clever...a good combo! Taking some "profiler's license," as I often due, I'd like to name the planet that Starlord encountered in Marvel Premiere#61 "Symbion." This is mostly for clarification and future reference. Lastly (for now), Ship and Sinjin visited a planet called R'Ralmis and mentioned that the Master of the Sun once lived there. Whether this is the same place that Starlord visited in Marvel Preview#4 is unclear. Quill got an entry in OHotMU 2006 A-Z#10. Jason of Sparta, Quill's father. Although he was never referred to as Starlord, he wore a similar uniform and did fly "Ship." Any others "Star"-somethings or whatever-"Lords"